Pandaw Cruises, pioneers of river cruising in Southeast Asia, is building smaller, shallow-draft vessels to open up the virtually untapped spectacular upper reaches of the Chindwin and Irrawaddy rivers in Myanmar. This will mean year-round cruising for the first time through some of the most picturesque mountain and forest scenery in Southeast Asia right up to near the Indian border with calls at towns and tiny villages rarely seen by tourists. Australian representative for Pandaw, John Boyd, said the company, which currently operates 11 vessels in Myanmar and Vietnam with two more scheduled for 2014, was concentrating on building shallow-draft ships for more in-depth exploration. This was contrary to the policy of other river operators frantic to build or buy large capacity less-navigable river craft for the already crowded Pagan-Mandalay sector of the Irrawaddy, he said. The new shallow-draft 40-passenger Pandaw Kindat and Pandaw Kalaw can cruise to areas in Myanmar no other commercial vessel can reach. The tiny but luxurious Pandaw Kalay, which went into service in January, is the shallowest draft vessel in Myanmar (75cm). With one spacious owner’s suite and only four main deck staterooms, it is aimed at the private charter market. 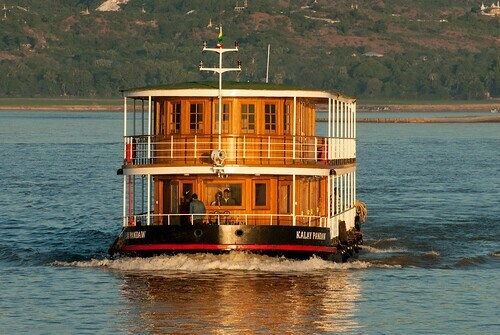 All Pandaw craft are replicas of pre-World War II colonial river steamers with comfortable teak and brass staterooms, fine dining and attentive Asian crew.